'Who is to blame for the death of Romeo and Juliet? Discuss.' 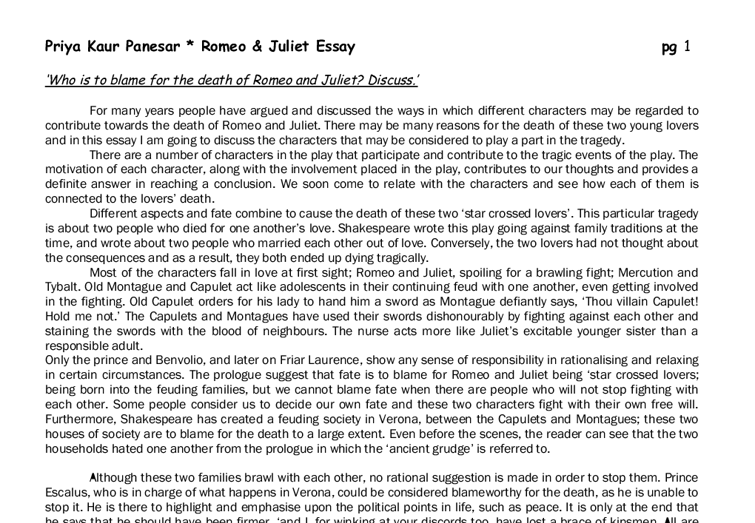 For many years people have argued and discussed the ways in which different characters may be regarded to contribute towards the death of Romeo and Juliet. There may be many reasons for the death of these two young lovers and in this essay I am going to discuss the characters that may be considered to play a part in the tragedy. There are a number of characters in the play that participate and contribute to the tragic events of the play. The motivation of each character, along with the involvement placed in the play, contributes to our thoughts and provides a definite answer in reaching a conclusion. We soon come to relate with the characters and see how each of them is connected to the lovers' death. Different aspects and fate combine to cause the death of these two 'star crossed lovers'. This particular tragedy is about two people who died for one another's love. Shakespeare wrote this play going against family traditions at the time, and wrote about two people who married each other out of love. Conversely, the two lovers had not thought about the consequences and as a result, they both ended up dying tragically. Most of the characters fall in love at first sight; Romeo and Juliet, spoiling for a brawling fight; Mercution and Tybalt. 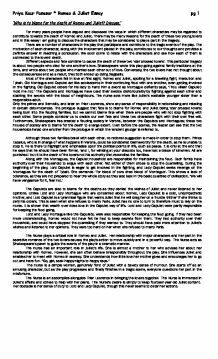 Old Montague and Capulet act like adolescents in their continuing feud with one another, even getting involved in the fighting. Old Capulet orders for his lady to hand him a sword as Montague defiantly says, 'Thou villain Capulet! Hold me not.' The Capulets and Montagues have used their swords dishonourably by fighting against each other and staining the swords with the blood of neighbours. The nurse acts more like Juliet's excitable younger sister than a responsible adult. Only the prince and Benvolio, and later on Friar Laurence, show any sense of responsibility in rationalising and relaxing in certain circumstances. ...read more. Such as Romeo's impulsive, passionate nature that, not only does he fall in love at first sight, he does not think about his actions. Throughout the whole play, the theme of haste and 'acting before you think' is reiterated. Romeo falls into love too quickly and acts too hastily. He does not think about what might happen as a result of this speed of life as he does not think things through. At the beginning of the play, we first see war; and now we hear about love, as Benvolio describes the behaviour of his infatuated friend. Romeo is up before dawn, walking alone in the woods and weeping; when the sun rises, he hurries home and locks himself from the outside world. These are the early symptoms of unrequited love, although neither Benvolio nor Romeo's parents appear to recognise this. We wait for Romeo to show us the extent of his love-sickness. He is miserable, however he enjoys his misery. What matters to Romeo is the emotion that he calls 'love'. It makes him happy and at the same time, makes him sad. He tries to express these two conflicting states in a series of witty paradoxes- phrases, which seem absurd. These are also an ominous, foreboding sign, as they are ironic and connect with Juliet's death, when she takes the drug; 'still-waking sleep'. During the balcony scene, and then after his wedding night he doesn't give any thought to what Juliet's family think. He would rather they find out and his 'life were better ended by their fate'. Better to love and die than die without love; 'than death prorogued, wanting of thy love'. This is ironic as Romeo did die for his love and ended this relationship with Juliet by departing with her through committing suicide out of love. Their engagement interprets a situation happening too quickly. Romeo shows significant queries about the sudden love between them, 'so thrive my soul-'. ...read more. Extract the Friar from the story of Romeo and Juliet, and one may find that there would not have even been a story. The Friar is an extremely important character. In conclusion I feel that each of the main characters contributed towards the tragedy consisting of Romeo and Juliet's death. The hasty marriage, wrongful use of the potion, failure to send the letter, and selfishness of the Friar are the causes for the deaths that occurred in the play. In spite of the many coincidences and references to heaven and stars, Romeo and Juliet however, is not totally a tragedy of fate. Each character has his/her freewill and is responsible for his/her actions. The substantial events that inspire the conclusion of Romeo and Juliet are; the Capulet ball, the quarrel experienced by Tybalt and Romeo, and Friar John's plague. The Capulet ball influences the ending of the play by Romeo's invitation at the ball, which creates the meeting of Romeo and Juliet. The ball also gives birth to Tybalt's anger and causes his challenge. The challenge causes the banishment of Romeo, which produces much grieving by Juliet and Romeo. Since Friar John did not deliver the letter, Romeo thinks that Juliet is dead, sacrifices himself. Juliet seeing that Romeo is dead, slays herself also. It could be said that fate has no part at all in the Romeo and Juliet play, that it all happened of it's own accord, and this could be possible. Personally, I think that too many things would have had to happen consequentially for it to all happen by chance - I still believe that Shakespeare was still hinting at the prospect of justice; that wrong doings will be punished in some way or other. Basically, I think that Romeo found true love, and paid the price for trying to get everything he wanted. He was initially put into a very difficult situation, from which an unfortunate chain of events couldn't be stopped from arising. ...read more. "O let us hence, I stand on sudden haste." Romeo also shows haste later on in the play. When he finds out about Juliet's death he rushes back to Verona without thinking about the consequences. This shows him making his rash decision to go back to Verona, "And hire those horses: I'll be with thee straight. facts at hand: "Thou art not conquer'd, beuty's ensign yet Is crimson in thy lips and and in thy cheeks" (ch5 sc3 ll94-95) Tybalt kills Mercutio accidentally through pure rage, no real reason assists Tybalt's behaviour just his hatred that he beers inside. Now there was no way the two families would be able to end the feud. Juliet now knew there was no way her and Romeo could be happy unless they run away together, so she returned to Friar Lawrence threatening to kill herself if he didn't help. Who was to Blame for the Death of Romeo and Juliet? It is a very important concept for understanding the events that led to the tragedy of the young lovers' death. Friar Lawrence is the person that marries Romeo and Juliet secretly. He is known and respected as an educated and holy man. Discuss the different types of love shown in romeo and juliet. The Friar and the Nurse cared a lot more for the welfare and happiness of Romeo and Juliet rather than just about the family honour and riches. The first person that Romeo goes to when he falls in love with Juliet is the Friar, to request a wedding. Capulet's reaction to Juliet is that of an enraged and very angry man and talks about he will "...drag thee on a hurdle thither" saying that he will take Juliet to church to marry Paris on a frame usually used for taking prisoners to execution. Who is to Blame for the Deaths of Romeo and Juliet?